A ground-breaking new family violence program to hold men accountable and keep women and children safe has received funding from the Victorian Government. Anglicare Victoria has welcomed funding for the A Better Way program, which it will deliver in partnership with the Victorian Aboriginal Child Care Agency (VACCA) in the Bayside Peninsula region. A Better Way will work with Aboriginal and non-Aboriginal families and will intervene directly where there has been violence, working with men to hold them accountable and to support women and children to help them heal from trauma. The program is based on the innovative Safe and Together model from the US and will support families where the perpetrator still has contact with their children, to reduce risk and prevent harm. It is expected to work with about 50 men and support more than 150 women and children. 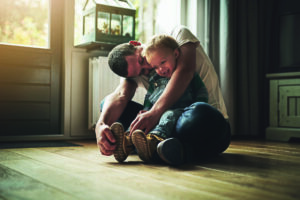 A Better Way will work with families for four to six months – providing a formal assessment of the impact on the men’s behaviour at the end of the program. It will also link families with other help such as alcohol and drug services, parenting courses or mental health support. Anglicare Victoria CEO Paul McDonald said the funding was a critical investment in keeping women and children safe. Mr McDonald said the program would hold men accountable by making it clear violence and controlling behaviour is their choice and highlighting the devastating impact it has on their children. “For too long our society has placed the responsibility for keeping children safe on women, and often labelled them as ‘failing to protect’ their children,’’ he said. “A Better Way will hold men to a higher standard, make it clear that they are responsible for being a good parent, for keeping their children safe and that their violent behaviour must stop. The program will be guided by Aboriginal Elders, respected people and cultural practice experts to break down the barriers which often prevent Aboriginal families from seeking help. It will address the individual needs of each family, working in a culturally safe and trauma informed way. It will also help Aboriginal families and children connect with their culture to promote resilience, healing and keeping children safe.